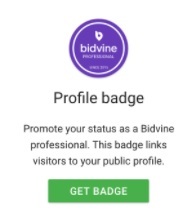 The Bidvine badge, if placed on your website links directly back to your own Bidvine profile. Any potential client that sees this knows that you are a Bidvine professional thus, instills confidence in dealing with you. To access the badge, from the top navigation select 'settings' then go to 'widgets'. Here you will be able to get the code required to insert the badge on your site. Just click 'Get Badge' and this will provide you with some options on the badges appearance, such as size and predominant colour. Once you have selected how your badge will look, click "Copy". This will copy the HTML code that you will need for your own website or blog. Once you've copied the code, all you need to do next is log into your website editor and insert the code (using your HTML/source editor) where you'd like your badge to appear. Depending on how your website was built or where it is hosted, you can most often search for "Inserting custom HTML" if you are unsure how to do this. Below are some instructions for adding custom html elements to some popular web-publishing applications.